سفاليريت معدن من معادن فلز الزنك له التركيب الكيميائي (ZnS). يتبلور المعدن في فصيلة المكعب ،نظام سداسي الرباعي الاوجه. ^ Frenzel، Max؛ Ketris، Marina P.؛ Seifert، Thomas؛ Gutzmer، Jens (March 2016). "On the current and future availability of gallium". Resources Policy. 47: 38–50. doi:10.1016/j.resourpol.2015.11.005. 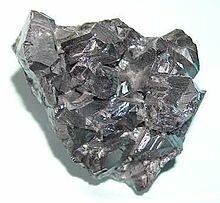 ^ Sphalerite. Webmineral. Retrieved on 2011-06-20. نسخة محفوظة 25 يوليو 2017 على موقع واي باك مشين. ^ Frenzel، Max؛ Hirsch، Tamino؛ Gutzmer، Jens (July 2016). "Gallium, germanium, indium, and other trace and minor elements in sphalerite as a function of deposit type — A meta-analysis". Ore Geology Reviews. 76: 52–78. doi:10.1016/j.oregeorev.2015.12.017.